There’s more to Moreton than meets the eye. Not only is it the third largest sand island in the world, it is a protected piece of paradise that has to be seen to be believed. Moreton Island makes for a very action-packed or super relaxed weekend adventure, it will pick up whatever vibe you’re putting down and the crashing of the waves will set the pace for the day. Please note: this is a sand island, meaning there are no roads and you will need a 4WD to get to your campsite, to the beach and beyond. Worth it, though. 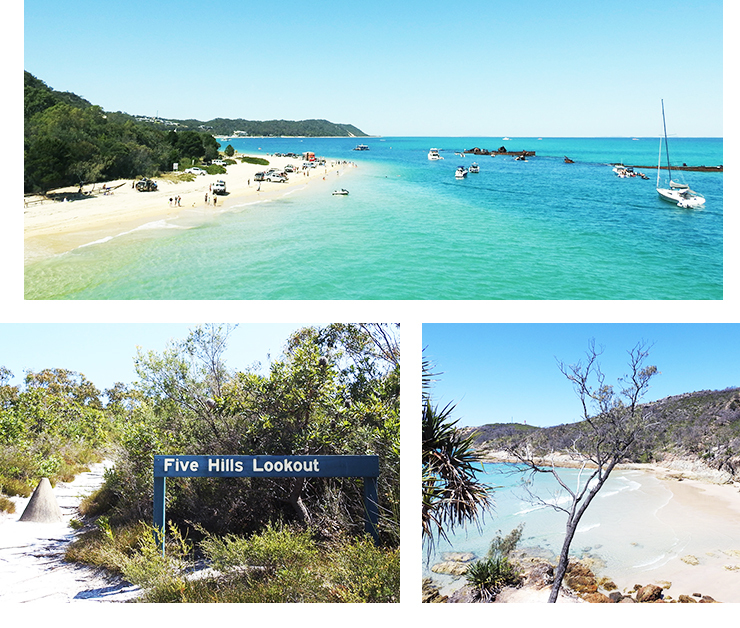 Consider it coastal camping at its finest; Moreton Island is an all-round epic spot to go camping. You will need a permit before you head to the island if you plan to camp at any of the campsites or camping zones. There are five national park campgrounds on the island if you prefer to have facilities like toilets and showers, or if you really want to get back to basics there are five camping zones that have no facilities. BYO toilet paper and drinking water, got it? Being a tourist in your own backyard is the bomb diggity. No 4WD, no worries! Book a tour with Sunset Safaris and you will see and learn that there truly is more to Moreton. They take care of all the logistics and you get to enjoy the hot spots of the island, while the guides have intimate knowledge that they pass on to make it one unique experience. Opt for the two-day tour and you can embark on a night-time kayak expedition exploring the eerie shipwrecks and abundance of marine life with underwater lights. If you are lacking in the camping gear department then we suggest you stay at Tangalooma Island Resort that has numerous accommodation styles to suit any budget. From hotels, units, villas, apartments and holiday houses with breathtaking panoramic views, it’s time to leave the mainland behind and switch to island time. Wild dolphins come into the bay every night at sunset, and you have the chance to feed them if you are staying at the resort. Sign us up! Glamping is a solution if you don’t want to sacrifice the great outdoors, but also need a touch of normality, sans sandy sleeping bag. The glamping site at Bulwer includes a canvas tent with own deck, queen-size bed, private ensuite with hot showers, solar powered lighting, linen and fresh towels. There is also access to a communal kitchen where you can cook up a storm. This is officially the new way to camp. You heard it here first. Let’s be real here, if you head to an island you are prepared to rough it, sleep in a tent and cook over a fire. Most camping sites have BBQs or grills you can use so it’s best to bring an esky full of food to get you through the weekend. The convenience stores on either end of the island have all your basics so don’t panic if you run out of milk or bread, or tomato sauce and snags for that matter. Dessert is ALWAYS Smores over the fire so don’t forget your marshmallows and biscuits. If you need a night off from camp cooking, look no further than Castaways if you are on the northern tip of Moreton. Open for breakfast and lunch every day, plus dinner Fridays and Saturdays with all round Aussie favourites on offer including fresh seafood, pizzas and burgers. Also a general store, you can pick up milkshakes, ice cream and all your basics like milk and bread and sunscreen. Situated a hop, skip and a jump from the beach, it’s easy to see why no shoes are required. Staying on the south of the island? Sick of burnt sangas? Fancy fresh seafood straight from the trawlers? The Gutter Bar & Restaurant will sort you out with their menu of steak, soups, salads and freshly-shucked oysters. They also play sporting events live on the big screen, are able to cater for events and have a general store right next door. Pretty much your one-stop shop if you are down in Kooringal. There are a number of dining options at Tangalooma Resort, though you have to be staying there to enjoy them or you can get yourself a casual visitor pass. The Beach Cafe offers up classic style takeaway meals for something quick and easy, while the Fire Restaurant has pre-warned you with its name. With a focus on Sichuan-style cooking from China, it has a reputation for being so spicy and hot that it’s mouth numbing! Not up for the challenge? Then Stone Restaurant is a signature dining experience where you can cook your steak, chicken or fish to your liking on your personal hot stone. The Coffee Lounge is for your mid afternoon caffeine and sweet fix or if you prefer to start happy hour early, B&B Resort Bar has all the beer, wine and cocktails you need. The wrecks are in perfect view when you arrive on the ferry and the stark contrast of the turquoise water, dense green bush and white sand is just jaw dropping. Fifteen vessels were sunk deliberately to form a break wall so small boats could have safe anchorage, and now make for the perfect snorkel spot. Bring your own gear and you can easily swim out to the wrecks from the shoreline…just be careful of the current when the tide is turning. Venture inland by 4WD approximately 20 minutes and you will come across a place aptly named ‘The Desert’. Welcome to your sand smorgasbord, and quite easily the most thrilling thing to do on the island. BYO piece of wood, or see if you can borrow someone’s for a turn at sliding down the biggest sand dunes. Take note; don’t scream with your mouth open! Unless you fancy a sandwich for lunch. This lookout is an easy one-kilometre walk from the side of the road on the way to Cape Moreton and well worth the stop. Situated at the top of a large vegetated sand patch, you will be treated to 360-degree views of the island over Heath Island, Yellow Patch and all the way to the lighthouse. The lighthouse is pretty special; being the first ever built in Queensland and built for convicts, believe it or not. Keep heading towards North Point and you will come across the Champagne Pools; named due to the sparkling effect created as the waves crash over the blend of volcanic rock and sandstone. The crystal clear water pools are too good to be true and the perfect place to relax in as the water bubbles and foams around you. It’s kinda like nature’s very own spa bath, BYO bottles of champagne, though. 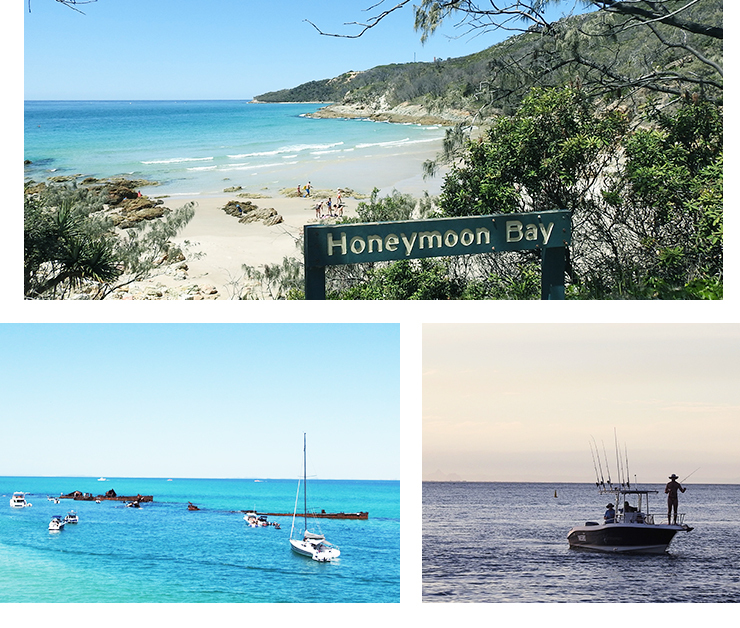 Everything feels appropriately named on Moreton Island, and Honeymoon Bay is no exception. A picturesque half moon shaped beach that is often deserted; at only 50 metres long and wedged between rocks, it’s the perfect place to unpack your picnic gear and stop for a refreshing swim and snack. Be careful of rips and rough seas though, there ain’t no lifeguards around these parts. If you are with your significant other, we won’t judge if you take a selfie at the sign. Yolo! Just when you thought there could be no more stunning scenery to set your sights on, Harper’s Rock is situated on the eastern side and is well worth a visit. A bizarre cluster of red sand formations that make you feel like you are on Mars. Mix a little water with the rock and you can form your very own clay for some face painting fun. Finish with a dip in one of the Seven Seas; the Coral Sea is at the base of the cliffs and is an ideal spot to wash the clay off your face. Thought Moreton Island only has salt-water options? Think again, cause Blue Lagoon is what’s called a ‘window lake’ meaning the water table meets the ground surface resulting in a catchment of fresh rain water (42 kilometres squared, to be exact). The lake is even infused with natural tea tree oils and so makes for a very relaxing swim! This spot is quite popular and has its very own camping ground if you so fancy. If you’re looking for nature adventures closer to home, check out these top camping spots on and around the Gold Coast.